Vast! Hideous! Invincible! screams the ad copy. This 1967 Nikkatsu was none of these. A “Gorgo” knock off with some really bad effects, it has none the less achieved something of a cult status. After 33 years, VAP Records has finally released the complete score on CD in partnership with the DVD release (the film was released dubbed and subtitled on VHS here two years ago). Seitaro Omori's score is fairly unremarkable for the genre, however he did create a delightfully melancholy theme for the baby Gappa, kidnapped by an unscrupulous entrepreneur (are there any other kind?). There are also a number of intriguing percussion tracks for the islanders, not anywhere near as authentic as Ifukube's well researched ethnic music, but a refreshing change of pace. 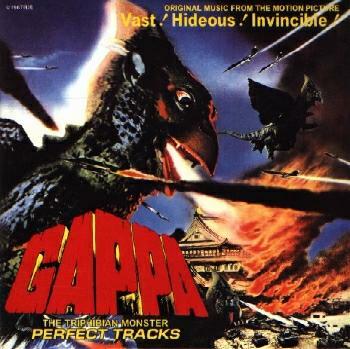 Rounding out the album are several versions of the “Gappa” songs, both film and single versions. The 24-page booklet features reproductions of the lobby cards and original film poster. At $40 by today’s exchange rate, it's very pricey for mediocre music. 20. Proceed With Operation "Sound Wave"
22. Preparing for Operation "Sound Wave"
23. Launching Operation "Sound Wave"
26. Don't Give Up, Baby Gappa! 38. Don't Give Up, Baby Gappa!